French trio Heaume Mortal, comprising of a former live member of Glorior Belli as well as Cowards vocalist Julien Henri and drummer Jordan Bonnet, play a distinct and original form of black metal that borrows heavily from sludge. It makes for a brittle, nasty album in Solstices that's not without moments of beauty; as much at ease with two-minute bursts of hate like South of No North as it is longer pieces such as the thirteen-minute Yesteryears, and the album keeps a steady pace going between them, feeling more like one long piece than individual compositions. 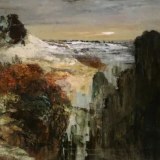 Despite the heavy sludge influence that often strays towards the realm of bands like Neurosis, not least thanks to a grasp of pacing that can incorporate sections of feedback smoothly and naturally, this is very clearly black metal to the core, from Henri's harsh snarls and yowls to the dark, miserable atmosphere that pervades throughout. It all makes for a fascinating listen, particularly when the band experiment further with their sound and take a step towards doom territory on Oldborn. And they always seem to make interesting choices, such as sticking a cover of Burzum's Erblicket die Tochter des Firmament in the middle of the album, taking the track in an even darker direction with plenty of disturbing extra howls from Henri. That Burzum feel continues into Tongueless (Part III) with its melodic yet melancholic riffs, and strange experimental outro Mestreguiral with the sound of someone walking beneath humming and plinking keyboard ambience. As a debut album it's not earth-shatteringly profound but is excellent and more than interesting enough to hold your attention for multiple listens, even without that strikingly beautiful bit of abstract album art. Yet another good black metal release in a year that's starting to look like a golden era for the genre!